Power bank with a capacity of 18000mAh which is also a jump starter. 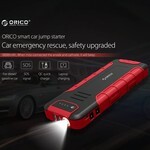 Start the petrol car, motorcycle or diesel car in an emergency. Features a rubber protective layer and a safe, lightweight Li-Po battery. Are you often on the road with the car and does it happen that your car does not want to start anymore? Then this jump starter from Orico is the product you need. You can start a 12V petrol car, engine under 6.0T and diesel car under 4.0T. 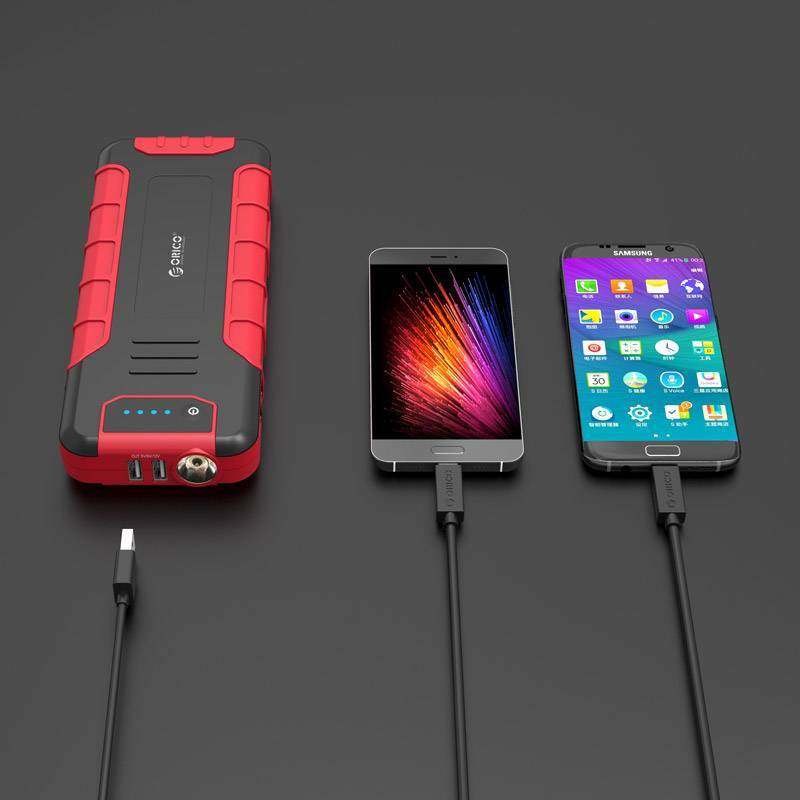 You can charge the outdoor power bank with the included Quick Charge charger. The jump starter and outdoor power bank is fully charged in 2 hours, and can then start 25 times a car or motorcycle. 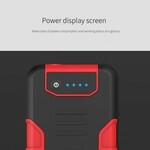 The product has a capacity of 18000mAh, with which you can fully charge your smartphone 8 times. You can also charge an iPad mini 3 to 4 times or 2 to 3 times another tablet such as the iPad 9.7. In addition, it is also possible to charge a laptop! 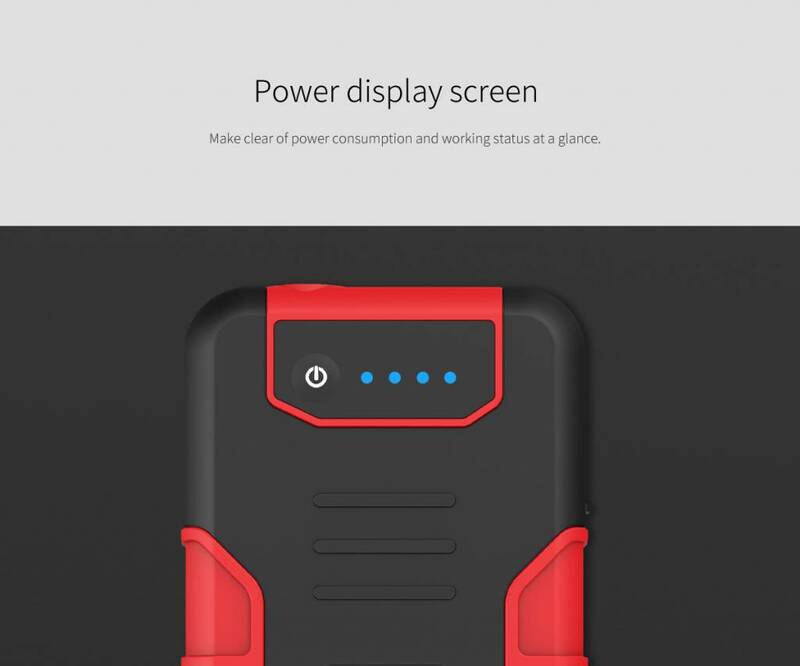 The outdoor power bank can be used during outdoor events such as festivals, holidays and during camping. 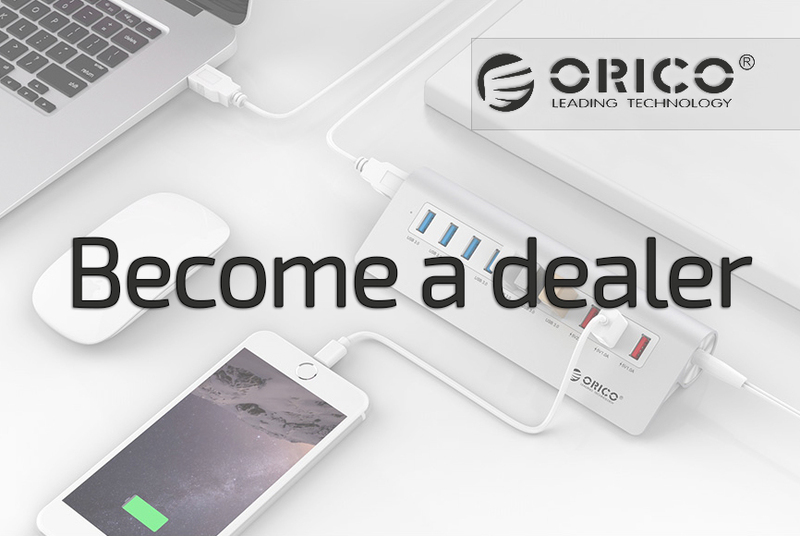 9 laptop connectors are supplied with Orico's tough jump starter. 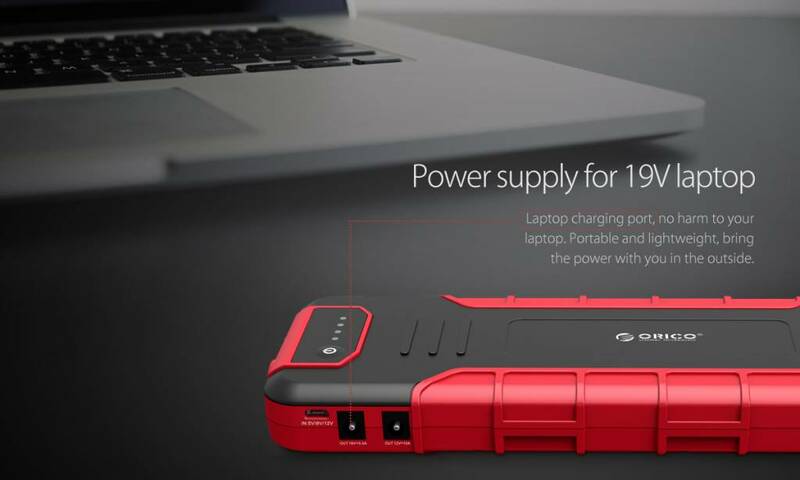 This means that both 19V laptops can be recharged using the outdoor power bank. 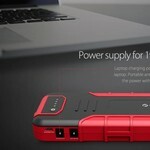 In addition, you receive a Quick Charge charger, with which you can charge the power bank up to 75% faster. You will also receive a Micro USB charging cable, with which you can charge any 5V device with Micro USB connection. The charging cable can be connected to one of the two Quick Charge USB charging ports (5V-2.4A / 9V-2A / 12V-1.5A). The charging ports are equipped with an intelligent chip, so that the connected device is recognized and the correct amount of power is supported (1A when charging smartphone, 2.4A when charging tablet). 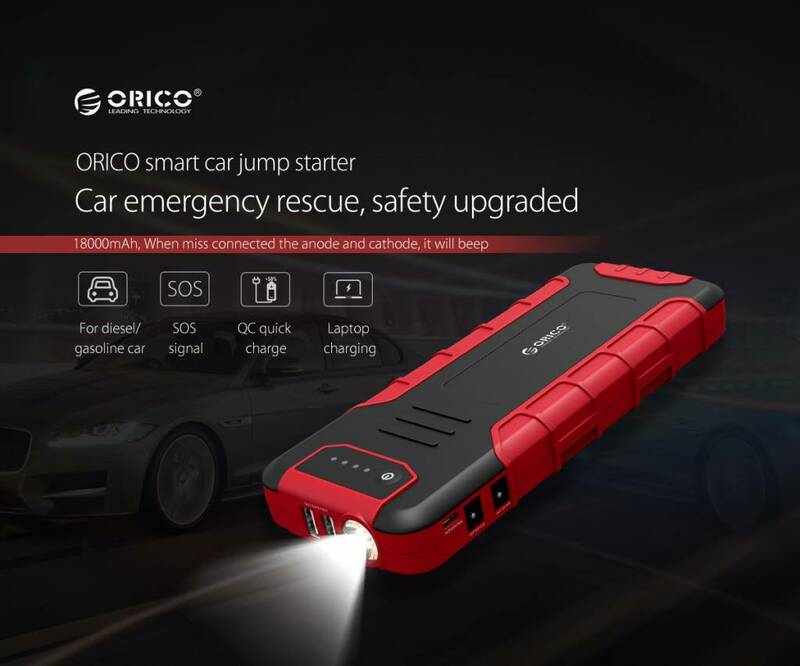 The 2-in-1 power bank and jump starter from Orico has a Lithium Polymer (Li-Po) battery. It has high quality and approved polymer cells, which ensures optimum performance, good protection, stable current and longer life. 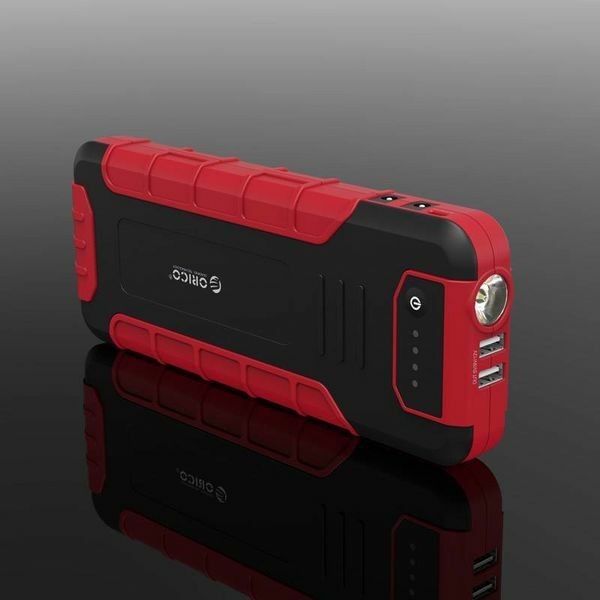 The Lithium Polymer battery is also more compact and lighter than other batteries. At the 2-in-1 car starter and power bank are clamps with which you can start the car or motorcycle. You connect both to the battery, the + and the - (black to black, red to red). If you connect them incorrectly, you will notice this by a warning beep. 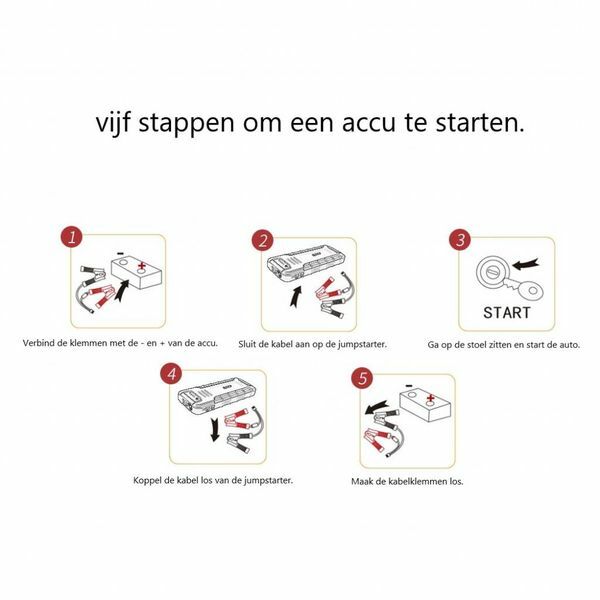 By connecting them in the right way, you avoid the risk of damage to the motor or battery. 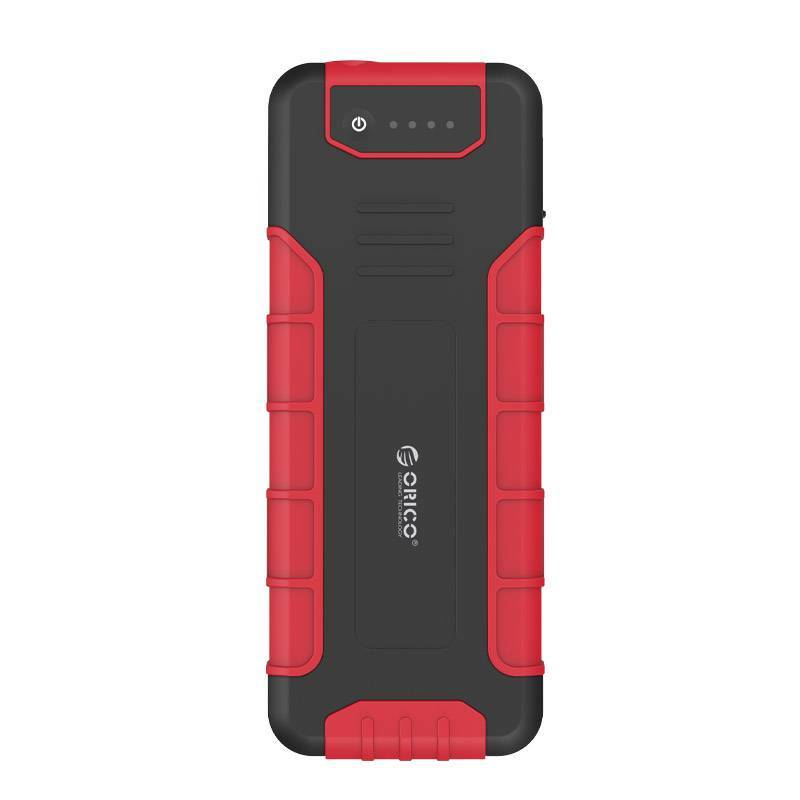 Because the outdoor power bank and jump starter has a protective rubber cap, it is waterproof and dustproof. 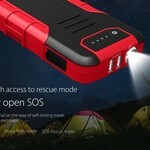 This is very useful if you have to use it in the rain or take it with you during camping, a festival or other events. The product can also be used in extreme weather conditions. He will still do his work at a temperature of -20 degrees in the winter or at +60 degrees when the jump starter has been in the car during a hot summer period. 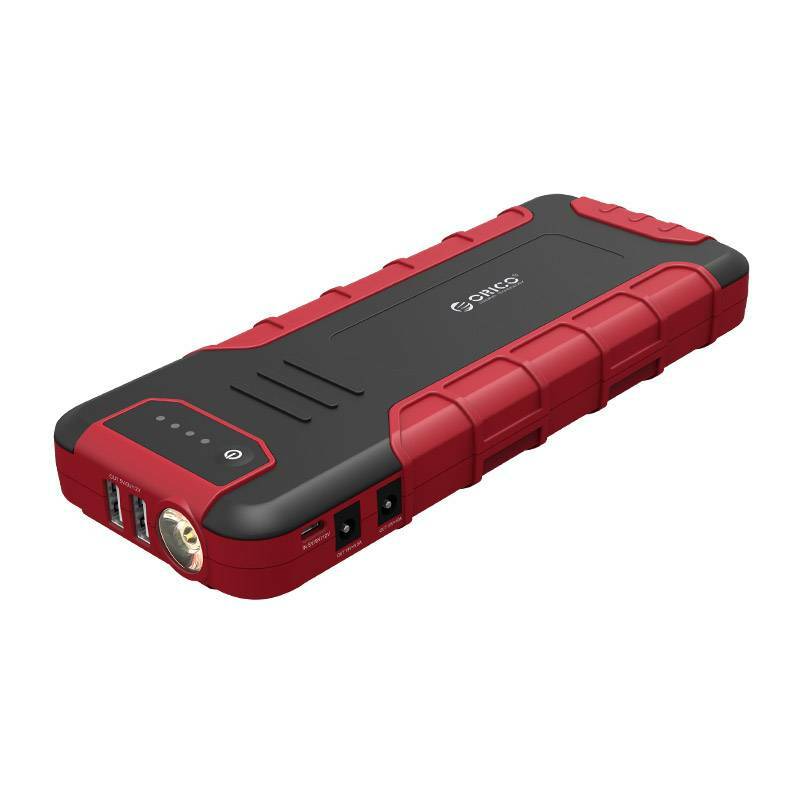 In addition to all the advantages of this jump starter and power bank in 1, the product also has a flashlight. 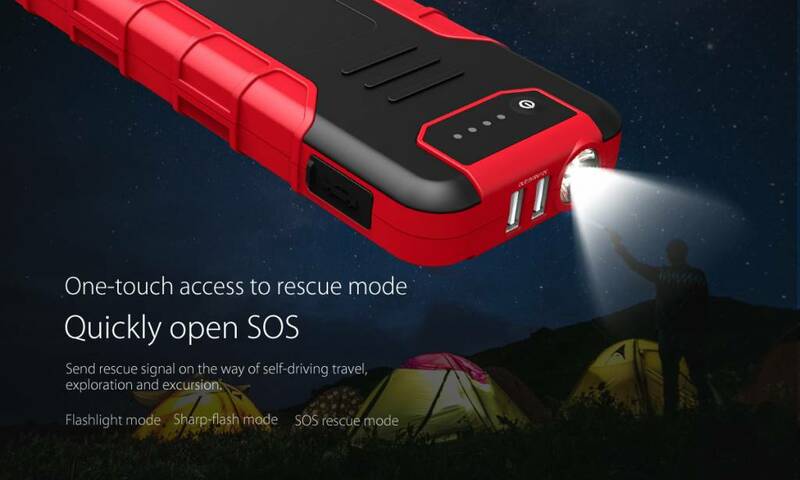 This can be used if you have to start the car in the dark, but also in case of emergency to send an SOS signal, to find your way in the dark or to find your things in your bag. 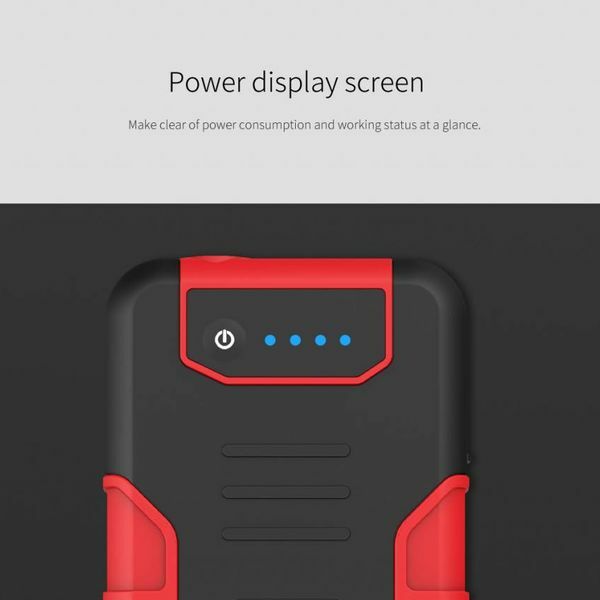 ✔ 2-in-1 jump starter and power bank. ✔ Material: heat resistant ABS and rubber. ✔ DC output: 12V-10A, 19V-3.5A. ✔ Charging via Quick Charge charger. 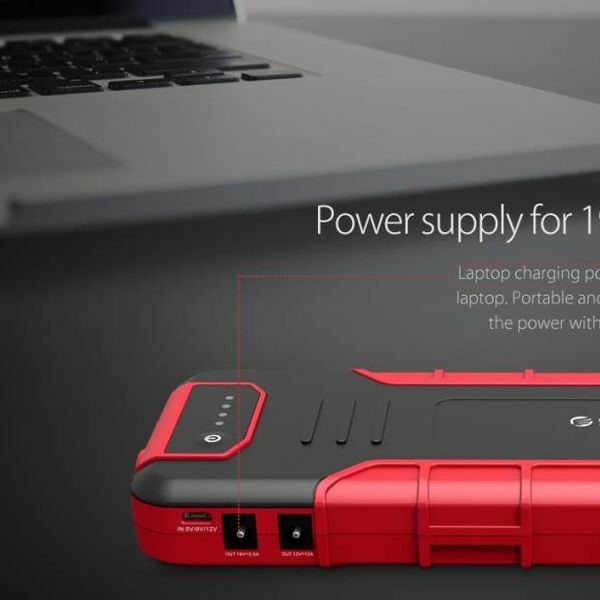 ✔ Equipped with a laptop / power charging port for a 19V laptop. ✔ Suitable for charging smartphones, tablets, laptop etc. ✔ Flashlight with flash mode / SOS mode. ✔ Water and dust proof with rubber protective cap. ✔ Lithium Polymer (Li-Po) battery. ✔ Color: black / red. 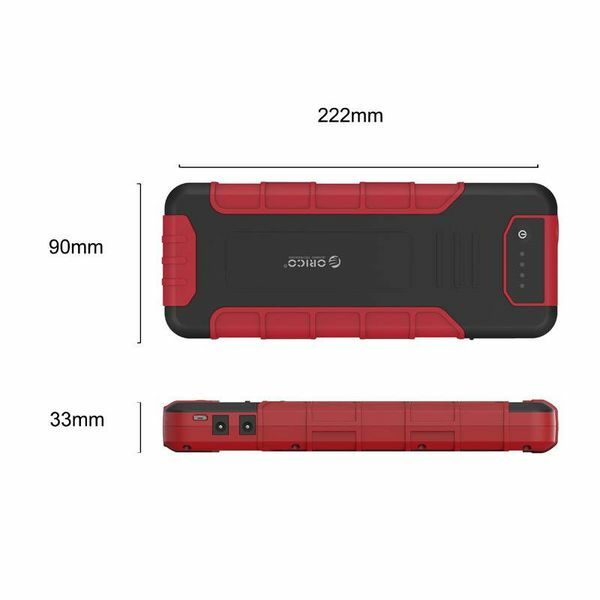 ✔ Product dimensions: 222mm x 88mm x 28mm. ✔ 18000mAh autostarter / outdoor power bank. 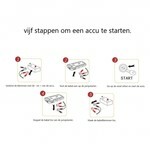 ✔ Quick Charge charger (EU). ✔ Various laptop connectors for broad compatibility. ✔ Micro USB charging cable.